Every now and again my boy – often known as Mr Happy here at CraftyMummy HQ – has a burst of creativeness. But being an 8-year-old boy, I’m not supposed to notice — and certainly not supposed to make any comments! Some of them worked and others of them just made him very frustrated. I bit my tongue for a while but eventually offered to help. Then he found this origami 8 Point Ninja Star tutorial and came asking about paper and cutting squares to exactly 9cm. I reminded him that as an ex-Japanese-teacher I could do better than that: I had a stash of proper origami paper. Finally I’m allowed to help! We found my origami paper stash and decided that if we cut the 7″ paper into four squares, it would be perfect for this star. My paper trimmer was up to Mr happy’s exacting cutting standards and he went back to YouTube armed with 8 paper squares. 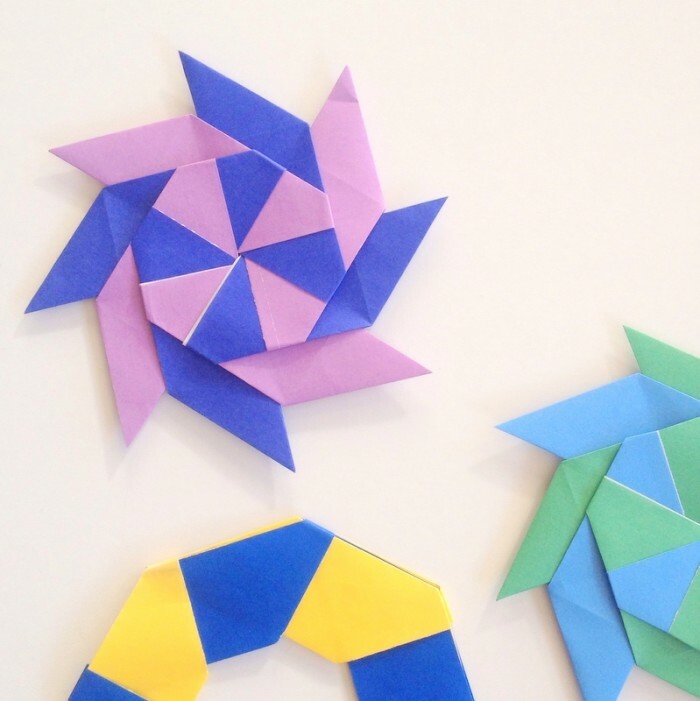 These very cool transforming ninja stars! Once the 8 squares are folded, they slot together to create a circle. Then the circle slides closed to make an 8 pointed star. Being a generous kid, he immediately created another for his best friend in the friend’s favourite colours – and let me take some pictures – before he carefully made them back into circles “so the points won’t get bent on the way to school”. I’m guessing there will some more origami activities this afternoon after school. Probably fulfilling requests from more friends! Disclosure: There are some affiliate links in this post. This just means that if you click through and purchase something on Aamazon, I may get a small commission – at no extra cost to you of course. This helps me keep my website and tutorials free for readers – thank you!